Dianne Saron’s work will be featured in the gallery in a titled show “Capturing the Beauty of Landscapes in Pastel”. An opening reception will be held Friday, January 6, 4-6 pm. The exhibit will continue through February. Saron moved to Door County in 2001. She had worked primarily in black and white portraiture. 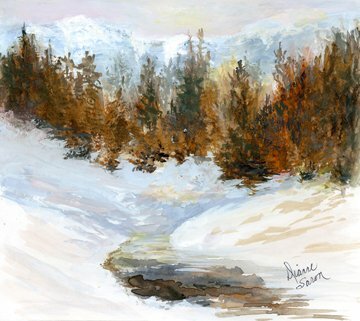 In retirement she found time for her passion to portray the beauty all around her. She comments, “The breathtaking winter sunsets that seem to be on fire, or the light as it reflects on water and rocks just beg to be painted ”. Soon after moving here, while attending classes taught by Mary Bosman, Saron discovered a new love for pastels to augment her efforts to capture the beauty of the settings. As an avid student, interested in various techniques and the many opportunities for learning, Saron soon was to be acclaimed for her talent. She gives credit to several of the artist teachers at the Peninsula School of Art. 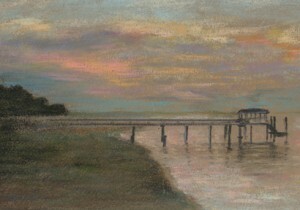 Her painting “Sunrise at the Sunset Resort on Washington Island” will be shown in this exhibit and has won honorable mention at the Fairfield Art Museum. Other paintings to be shown have been in other invitational, juried shows. Currently her paintings can be seen at the Miller Art Museum, Sturgeon Bay and the Paint Box Gallery, Ephraim. 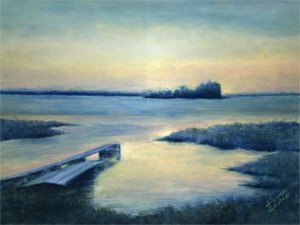 Diane is co-chair of the Guenzel Gallery, Peninsula School of Art and is the program chairman for the Door County Art League. She is also a member of the Paine Art Center and Gardens in Oshkosh, WI, the Francis Hardy Center for the Arts in Ephraim, the Miller Art Museum volunteers, Sturgeon Bay and the cooperative gallery of the Door County Art League, Fish Creek.